Case Studies of Sustainable Living! 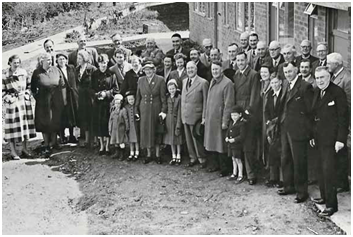 Olwen remembers as a child walking through deep snow in the winter of 1962/63 through Doxey to school in Stafford. The pictures of people in their front gardens of the cottages in Mount Pleasant are those of her grandmother Amy Foden (later Craig) and her sisters, the youngest of which was Agnes, her father John Foden and his wife Sarah. (Amy’s uncle, Richard Foden, also kept the Red Lion Public House). John and Sarah Foden had 9 living children– 8 girls and 1 boy. They unfortunately lost a little girl who lived just 6 days. Amy was the second eldest. Her married sister lived next door and she is also in the photograph. Amy Craig was the first tenant in the Castle View flats; she lived at No. 21 for 28 years. Amy was born at Mount Pleasant Cottages in March 1884 and was one of the first pupils to attend Seighford School. Along with her sisters and other Derrington children she used to walk there and back each day, in all weathers, across fields and country lanes. Amy went into service at the age of 13, first helping in her uncle’s pub, then as a live in help to an old lady in Whitgreave. By the age of 17 (1901 census) she was a domestic servant in the house of a family Northfield, in Birmingham. The 1911 census confirms that she was cook/housekeeper to a Reverend Abbey Tindall in Didsbury, Manchester. At some stage she was also in service for a Doctor Bloomer, whose surgery was in Mount Street, Stafford. Following her marriage to Jim Craig in 1915 Amy lived with her family at Mount Pleasant while Jim was fighting in France during the First World War. They eventually set up home at Lane End Cottages (long demolished) where all 4 of their daughters were born, then at Billington House near Haughton, and then in 1936 moved into “Latham Grove”, a bungalow in Long Lane. Amy was a very sociable and friendly lady, well loved and respected by those who knew her. During the Second World War both she and her husband Jim were very supportive of the young airmen based at RAF Seighford, an initial training base for bomber crews. They were so well liked by the airmen that they received invitations to dances at the base, which they attended with their daughters – it was at one of these that Olwen’s mother Ellen met her father, Flying Officer Roy Bell. Jim died in 1950 and in 1955 Amy moved into the Castle View flats. Olwen’s parents bought the bungalow in Long Lane and they lived there until 1968.Amy died in 1989 when she was 105 years old and probably remains one of Derrington’s longest living residents. Annette Clay, Olwen Bell and Carole Watson. 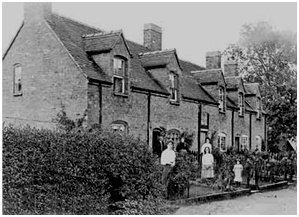 A little more information on the family …..
Amy’s mother and Olwen’s great grandmother Sarah Foden, nee Hilditch, (1861 – 1943) was brought up in the black and white timbered cottage at Aston by Doxey by her grandparents (Mr. And Mrs. Sneath), as her own mother had died following childbirth. Her father Joseph Hilditch was a blacksmith at Stone and he too died when Sarah was just 7 years old. The Fodens were landlords at the Red Lion from 1861 to 1911, firstly John Foden Snr (1822 -1892) and his wife Ann and later his youngest son Richard Foden and his wife Harriet. John Foden Snr was an agricultural labourer as well as a Publican (this was quite usual in the 19thcentury), and he had four children, Sarah, Thomas, John Foden Jnr (1857 – 1937), who was Olwen’s great grandfather, and Richard. According to Amy there were often drunken fights on payday between local labourers and nursing mothers used to feed their babies gin to keep them quiet.